While we all have to recognize the huge potential that solar energy brings us, we also have to say that sadly, so far, we’re not very effective at harnessing this energy. The best modern silicon and indium-tin-oxide-based solar cells are approaching the theoretical limit of 33.7% efficiency. The team led by Stephen Chou made two dramatic improvements: it reduced reflectivity and more effectively captured the energy which isn’t reflected. 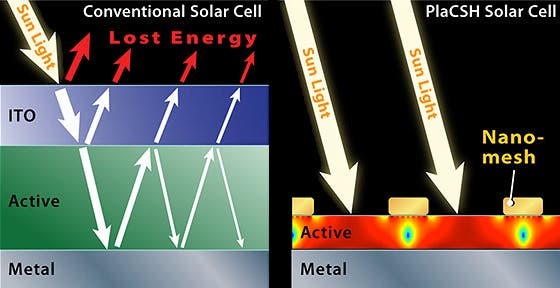 They created a much thinner and less reflective device by sandwiching plastic and metal with the nanomesh – obtaining something they call “Plasmonic Cavity with Subwavelength Hole array” or “PlaCSH”; it now reflects only 4% of direct sunlight, leading to a 52% higher efficiency than conventional, organic solar cells. PlaCSH is also able to absorb a great deal of sunlight even when on a cloudy day, making it 81% more effective in indirect light conditions than conventional organic solar cell technology. All told, PlaCSH is up to 175% more efficient than conventional solar cells. The team believe the device can become cost effective using a nanofabrication method that Chou himself invented over a decade ago. Most importantly, it replaces the costly ITO (indium titanium oxide) element from solar cells – which will make it affordable and much more flexible than the ITO of conventional solar cells. The improvements are for organic solar cells, which are typically way less effective than traditional silicon solar cells. Organic solar cells use organic electronics, a branch of electronics that deals with conductive organic polymers or small organic molecules, for light absorption and charge transport to produce electricity. The main argument for organic solar cells is that they are much, much more cheaper than the top silicon cells available today. However, they are also much less effective. The mesh they obtained in the study had an efficiency of 4.4%, which is among the best number for that materials system even though their device is much thinner.